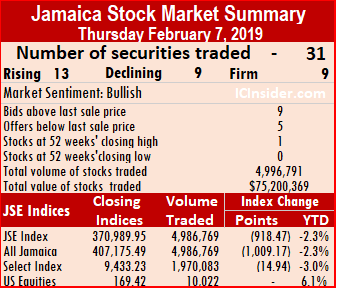 Trading picked up over that on Wednesday on the main market of the Jamaica Stock Exchange ended on Thursday with JSE All Jamaican Composite Index falling by 1,009.17 points to 407,175.49 and the JSE Index declining by 918.47 points to 370,989.95. Main market activity ended with, 4,986,769 units valued at $74,552,633, in contrast with 2,541,810 units valued at $57,485,785 on Wednesday. The main and US markets traded a total of 31 securities, with prices of 13 rising, 9 declining with 9 remaining unchanged, compared to 34 securities trading on Wednesday. 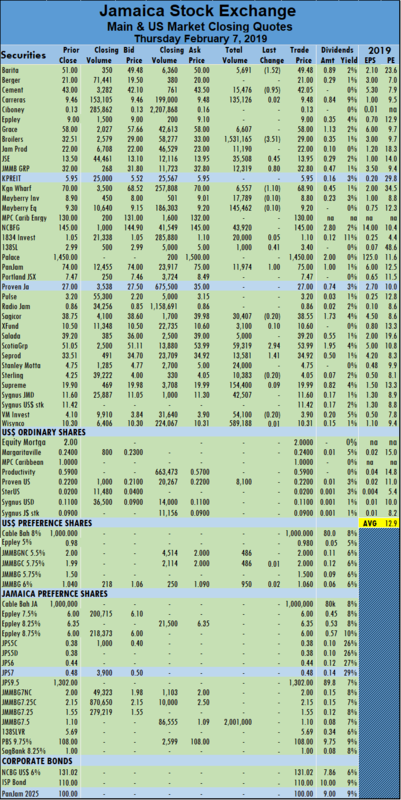 JMMB Group 7.5% preference share led trading with 2,001,000 units for 40 percent of the day’s volume, followed by Jamaica Broilers with 1,531,165 shares and accounting for 21 percent of the total main market volume changing hands and Wisynco Group with 589,188 stock units for 12 percent of the day’s volume. IC bid-offer Indicator|The Investor’s Choice bid-offer indicator ended with the reading showing 9 stocks ending with bids higher than their last selling prices and 5 closing with lower offers. An average of 184,695 units valued at $2,761,209, in contrast to 42,483 units valued at $1,358,497 on Wednesday. The average volume and value for the month to date amounts to 523,805 units valued $16,891,062 and previously, 523,805 units valued $16,891,062. Trading for January resulted in an average of 101,980 units, valued at $3,042,494, for each security traded. In main market activity, Barita Investments fell $1.52 to close at $49.48, with 5,691 shares changing hands, Caribbean Cement shed 95 cents to finish at $42.05, trading 15,476 shares, Jamaica Broilers dropped $3.51 in trading of 1,531,165 units, to close at $29. 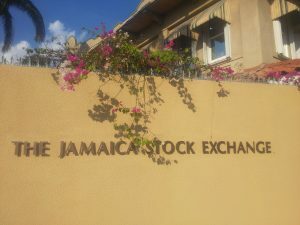 Jamaica Stock Exchange closed trading with 35,508 units changing hands, with a rise of 45 cents to a record close of $13.95. JMMB Group concluded trading with 12,319 shares but rose 80 cents to $32.80, Kingston Wharves lost $1.10 and settled at $68.90, with 6,557 units changing hands, 138 Student Living rose 41 cents to $3.40, in trading 1,000 units, PanJam Investment rose $1 to end at $75 with 11,974 units changing hands. Sagicor Group fell by 20 cents in trading 30,407 stock units, to close at $38.55, Scotia Group climbed $2.94 and finished trading of 59,319 shares at $53.99 and Seprod lose $1.41 to end at $34.92 with an exchange of 13,581 shares. Trading in the US dollar market resulted in 10,022 units valued at US$4,728 changing hands. JMMB Group 6% preference share concluded trading with a gain of 2 cents to settle at $1.06 with 950 units, JMMB Group 5.75% preference share finished with a rise of 1 cent to $2 with 486 shares trading, JMMB Group 5.5% preference share settled ended at $2 with 486 shares and Proven Investments traded 8,100 units and rose 1 cent to close at 22 US cents. The JSE USD Equities Index was unchanged at the close at 169.42.